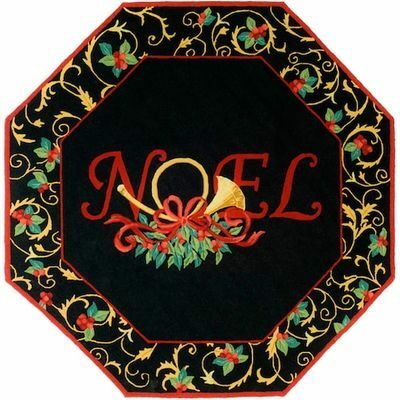 Great selection of cabin rugs that will give you ideas for decorating your log or timber home. Choose from one of the rug types below, or, if you prefer to shop by themes, you can do that here. Themes are important because often the rug in your room will set the theme for the rest of your room’s decor. There are a wide variety of really cute accent rugs that you can use, many with beautiful wildlife images and others with whimsical designs. While we typically think of rugs being used on the floor, many of these striking designs could also be hung on the wall as a tapestry, and smaller sizes could be used as runners on a side table or coffee table. 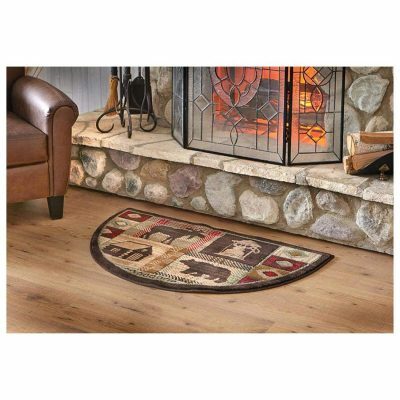 Rustic area rugs add color and character to your lodge or cabin. 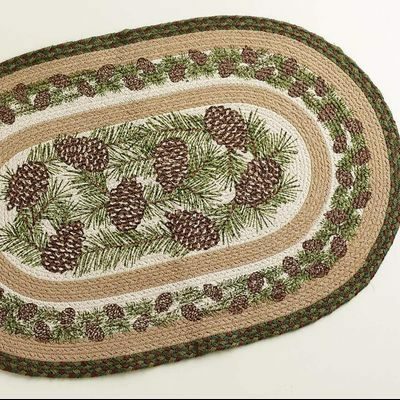 Using these accent rugs can enhance your log cabin theme or simply give personality to a room. Of course, many people who don’t live in log homes have fun with cabin rugs, creating a “retreat” room in their home that is far away from the country. In fact, if you choose the right rug, you can actually set the theme for a particular room. An area rug can be the central piece that you build your whole room’s décor around! 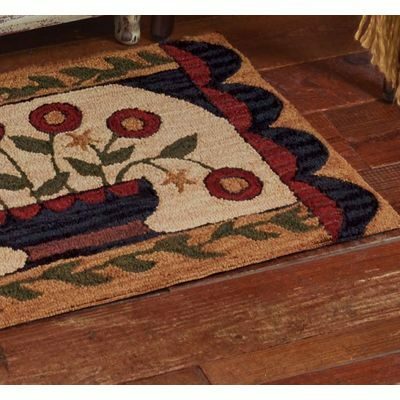 You may be interested in reading about more about log cabin rugs in rustic homes. Did you ever stop to think about why you love a braided area rug? For many of us, a braided rug brings up memories. Memories of our childhood—of going to Grandma’s house and playing Monopoly on her big braided area rug. Perhaps you remember a vacation, where you spent the week at a cabin on the lake. The worn braided rug in the gathering area was so inviting. Sometimes it just doesn’t pay to buy cheap braided rugs. Putting your money into a good quality wool rug that will last for years, might make better sense for you. And a good quality wool accent or hearth rug has such a luxurious and timeless look! In addition, wool is a flame retardant material. Braided wool rugs add a luxurious but homey look to log cabins, post and beam homes or lodges. Braided accent rugs can also give a traditional, but timeless look, to country homes. The right wool area rug can give you many years of use and it can be cozy and warm on cold winter evenings. Braided rugs come in so many colors and designs now, that you can use them in almost any decorating scheme. And a braided area rug, in addition to providing color and character, can help to give your home a warm, cozy cabin look. Wool braided rugs add a touch of rustic class to a country log or timber home. With so many braided rugs available to you, how would you use a braided area rug? Braided wool rugs have a long history of being used in traditional homes with Colonial furnishings. Modern interior decorators are using braided rugs in contemporary homes, as well. Both log and timber homes look great with braided rugs. Perhaps the difference between furnishing a contemporary timber frame or lodge and a traditional log cabin is the use of color. Often contemporary homes choose light, bright colors (or black and white), while the more traditional log homes choose muted colors and sometimes darker colors. Fireplace rugs are the finishing touch in front of your gas log or wood fireplace. Hearth rugs add warmth and a little color, and they traditionally follow the theme of your decor. Typically your eye is drawn to the focal point in the room, to the fireplace. A hearth rug should be secondary to the fireplace, which is almost always the most impressive element of the room. While the fireplace might be the focal point of your room, the hearth rug is not. It is simply a complement to the other furnishings in the room. As such, it must blend in, and not draw your eyes exclusively to the rug itself. Keep in mind that your hearth rug should have a similar theme to the other furnishings in the room and the colors should be complementary to the other colors in the room. When choosing fireplace rugs, keep your decorating theme in mind, and the colors that you have used in the room. Traditional fireplace rugs are braided or they can be hooked. Or, if you prefer, you might choose a more contemporary rug for the cherished spot in front of the fireplace. Choose carefully, and your accent rug in front of the fire will add to your decor, instead of detracting from it. Wool is a wonderful fabric or yarn for a fireplace rug, as it is naturally fire retardant and naturally flame resistant. Because of this, any rug that has wool as its main material does not need to have chemical flame retardants added to it. That’s a plus for you if you or your family is sensitive to chemicals used in fabrics. Because of its natural fire safe characteristics, wool carpet is used in places where there are strict regulations, like passenger aircraft. And wool is also one of the best and safest choices for your fireplace rug, as well! 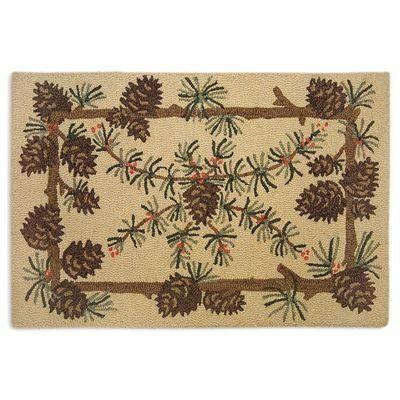 Rustic Area Rugs come in wildlife themes, pinecone rugs, deer rugs, moose rugs, or any other kind of outdoor theme can give you the rustic feel that you’d like. Rough textures and natural colors can add interest to a room. So just how do you go about finding the right rustic decorations for your new log or timber home? Choose the large decorating items in your room first—your area rugs, curtains or drapes and any large decorative accessories. Then choose rustic home décor accessories that go well with your large room accessories. Keep your colors coordinated with your accent rugs and wall color, and keep your theme loosely connected. For example, if you have a log cabin on the lake, you can use ducks, moose, bear, fish and lake scenes—and they will all work well together to get a rustic by-the-lake look. Choose furniture that goes well with your rustic area rug, but make sure that it is comfortable and cozy in addition to looking great. Rustic area rugs are the element that brings a room full of sentimental and rustic accessories together. Your rustic area rug will set the mood for the rest of the room! Rustic area rugs bring warmth and coziness to a log or timber home, whether the cabin is a hunting camp or a luxury ski lodge in the mountains. And one of the nice things about using rustic area rugs is that they work well with many decor themes. 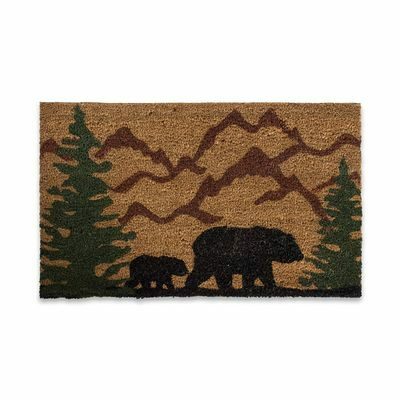 You can use a rustic cabin rug with an Americana theme, as easily as with a wildlife theme or simply country decor. Did you ever think about why you enjoyed your vacation in the little cabin by the lake so much? Of course some of the fun was the boating, fishing and swimming. But I’ll bet that you also remember some of the rustic furnishings in the cabin that made you feel so comfortable and relaxed. Rustic area rugs can help you feel at home. You should feel like kicking back and relaxing. And you shouldn’t be afraid that you’ll damage something by using it. Choose furnishings that can take your family’s occasional abuse. And, while you are at it, choose rustic accents for your room–like floor or table lamps, sconces, statues or carvings, tapestries, metal wall hangings or metal welcome signs to give your room its final touch. Washable rugs have their place in any home, adding character and charm to baths, kitchens and entry ways. And this is especially so, in country homes. 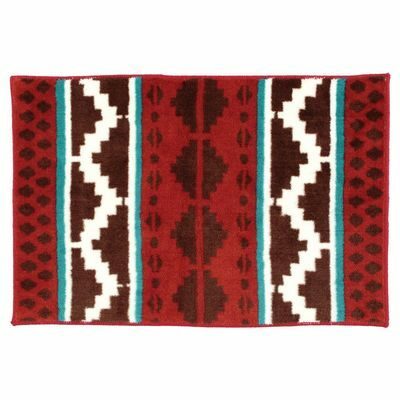 Used as accent rugs, washable cabin rugs can add character and charm to bathrooms, kitchens and entry ways. 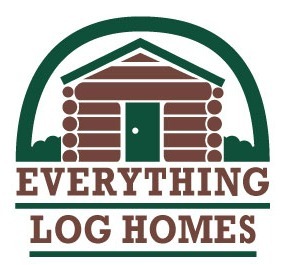 Most log homes (and often timber frame homes) are built in country locations. That means that you will have mud, and perhaps gravel (if you have a dirt or gravel road) tracked into your home. No matter how clean you are, your entry rugs will get dirty, and washable rugs can be a God-send! But these rugs don’t have to be plain, boring colors or designs. Not only do washable area rugs add beauty, but they also add practicality. And in any home, kitchen and bath rugs need to be cleaned, from time to time. Why not make it easy and just throw your rug in the washing machine? Living in a log cabin home or a timber frame home gives you the opportunity to decorate your home in a very personal style. You can use a very specific theme or you can decorate in an eclectic style, using whatever your little heart desires, in each room of the house. The bathroom, in recent years, has become one of the most personal rooms in the home. And, because decorating a bathroom or redoing a bathroom is relatively inexpensive, it is a fun way to get started on giving your home a new look! Bathroom rugs and mats, while seemingly unimportant, can make a huge difference in your rustic bathroom decorating! Bath rugs add color and they can enhance your rustic bathroom theme with images that complement your other bath décor. They can also soften your bathroom’s look. Most bathrooms are full of hard surfaces. They need fabrics, curtains, rugs and towels to soften their appearance. And fabrics and rugs also help cut down on the sound echoes in a room with all hard surfaces. To protect your flooring – wood floors that get wet can become discolored and worn looking. A simple rug or mat can help protect your beautiful wood floors. Softness when getting out of the tub or shower – It’s always nice to step out onto a soft bath mat when exiting a shower or bath. Warmth – In the winter, a bath mat or rug is warm on your toes and feet. Safety – Stepping onto bathroom rugs and mats, instead of a slippery wet floor, can prevent slips and falls. This is especially true if the rug is backed with rubber. Color – an otherwise all wood color scheme can come to life, with a splash of color. A bathroom rug can provide just what is needed. Your theme – If you are using a special theme in your bathroom, it makes sense to use a bath mat or rug that complements that theme. For example, people with lake cabins often use fish bathroom rugs in their bathrooms. A hunting lodge in the woods might have a bear or moose bathroom mat or rug. Reversible rugs – This is not important to everyone, but, if you are outfitting a hunting or fishing cabin that doesn’t have a washing machine, you might want to use reversible rugs in the bath. That way, you can use the bathroom rugs a little longer, between washings. Bathroom rugs and towels – Coordinate your towels and your rugs, for a nice well-designed look. So inexpensive to do, yet it makes a huge difference in the look of your bathroom. Color – Bath mats, whether large or small, can provide the color that you need in an otherwise drab or same color bathroom. Have fun choosing bathroom rugs and mats. They are so inexpensive that you can have different rugs for every season. And it’s like having a new bathroom, with so little effort!